Eagerly awaited, this casting will take place under the expert eye of Janet Pharaoh, artistic director of the Moulin Rouge and assisted by Erik Sorensen, resident choreographer. The artistic team will travel to Australia to pick up new talents who will perform on the stage of the famous cabaret, which has been illuminating Paris since 1889! Castings will be based on special requirements: strong classical dance training as well as criteria specific to the Moulin Rouge: minimum size (5feet 9inches for girls and 6feet 1inches for boys), well-balanced figure but also and mainly the personality, the charisma and the capacity to assimilate choreographies with class and distinction! And for the boys, a well-proportioned muscled body! After this casting, the Moulin Rouge will welcome the selected artists into the current show ‘Féerie’, expanding its team of dancers. The lucky dancers will travel to Paris for a month rehearsals and will join the team of 80 artists, from 14 different nationalities. “Féerie” is an amazing 2 hour-long show with 1000 costumes of feathers, rhinestones and sequins, sumptuous settings in shimmering colours, a 60 tonne-water aquarium and the famous French Cancan… An exceptional show which welcomes every year more than 600.000 spectators from all around the world! 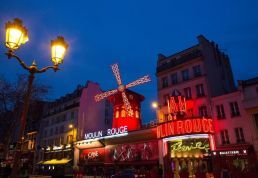 The Moulin Rouge will celebrate its 130th Anniversary in 2019!